Post subject: Global Warming- Driven by Humans or Natural Cycles? You have probably heard every single part of the upcoming catastrophe that is coming from the media- that it is a fact that has been proven and proven again that humans are driving the current climate, and natural factors are very small compared to the human forcing. Let's start off with an indirect proof. If Carbon Dioxide were driving the Climate, then we would see a reduction in overall OLR, since the Greenhouse Gases are poised to create a reduction in OLR- if they are the drivers of the Climate. However, what we can see from the observational data, is that OLR has actually increased during the time we were warming. What we can see is that OLR has increased by 11 w/m^2 since the beginning of the satellite era. According to the Climate Models, we should have seen a reduction in OLR at the TOA, due to GHGs trapping more and more of the OLR. But we haven't. Not at all. Here, we can see, as I explained earlier, that climate Models forecasted a downward trend in OLR at the TOA due to increased GHGs trapping OLR. We can see that reality shows that OLR has increased with temperature. It tells us that the warming is occuring through an increase in ISR, since if ISR were not increasing, and OLR was going up, we would experience cooling, since the energy leaving Earth, would hypothetically be greater than the Energy getting to Earth. The only possible factor that could cause an increase in ISR and an increase in OLR, is decreasing Cloud Cover. Decreasing Cloud Cover allows for more ISR to reach the Earth's Surface, but it also allows for more OLR to escape into space. However, since Cloud Cover overall reflects more ISR than it traps OLR, if all clouds were to be removed, an extra 17 w/m^2 would be added to Earth's Energy Budget. So we now know that it is impossible for CO2 to be driving the Climate, because of the reasons expressed above. But how do the CAGW Proponents reach the conclusions that they do? 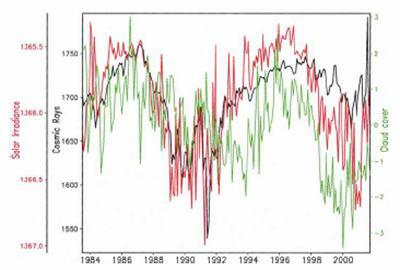 Well, often, they will show this graph which depicts a model that is modeling the Anthropogenic VS. Natural Forcings. 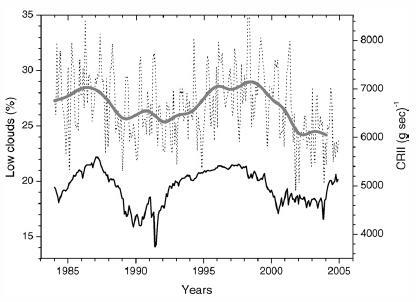 Note that according to the model, natural factors could not possibly explain the temeprature increase, because natural factors significantly diverge from observed data in 1979. But as already shown above, the model got the OLR Vs. Temeprature Component completely wrong, which shows that the models are misinterpreting something. But what is it? The implication of this optical depth bias that owes its source to biases in both the LWP and particle sizes is that the solar radiation reflected by low clouds is significantly enhanced in models compared to real clouds. This reflected sunlight bias has significant implications for the cloud-climate feedback problem. The consequence is that this bias artificially suppresses the low cloud optical depth feedback in models by almost a factor of four and thus its potential role as a negative feedback. The models, which all catastrophic statements are based off of, have gotten the Cloud Feedback completely mixed up. We know that they have gotten mixed up, because they got the Temperature Vs. OLR component completely off. But is CO2 causing a very small portion of the warming? Without any Feedbacks, CO2 does cause warming. However, in these next calculations, we will see how much CO2 would have contributed to the current Global Warming, without any climatic feedbacks. According to the IPCC, Carbon Dioxide causes a 1.4 w/m^2 of energy to be added to Earth's Energy Budget over a 104 year timespan. To get the effect that CO2 has had over this 21 year timeframe, you muliply the 1.4 w/m^2 by .2, since that is the value of 21 divided by 104. You get .28 w/m^2. Divide that by 7 w/m^2 to get the percentage that CO2 has contributed to the current Global Warming. You get 4%. Assuming that CO2 and Clouds are hypothetically, the only drivers of the Climate, CO2 contributed only .014 Degrees C to the .35 Degree C warming since 1979. Factor in Feedbacks, the PDO, AMO, IOD, QBO, Ozone Depletion due to Volcanism, the Solar AA index, and you can see how small of a role CO2 plays on the overall Climate System. It's effects are not even measureable. With these effects factored in, the effect of CO2 would even be significantly less than 4%. So in conclusion, Natural Drivers are dominating the current Climate Change, and always will in the future. Last edited by Snowy123 on Sat Jul 23, 2011 12:40 am, edited 1 time in total. You miss the obvious, if ISR increases the temperature can increase along with an increase in OLR. The solar output fluctuates a few percentage points too. If ISR increases the temperature can increase along with an increase in OLR. The solar output fluctuates a few percentage points too. I largely agree. If the rate of the increase in ISR is higher than the rate of the increase in OLR, you would get warming. This is consistent with Cloud Cover changes, since OLR has been increasing. We can then conclude that the warming since 1979 has largely been Cloud Driven, since it is one of the only feedbacks that can create both an increase in ISR and an increase in OLR. We know that ISR has been increasing, since an increase in OLR would cool the Earth, if there was no increase in ISR. If all clouds were to be removed, an extra 17 w/m^2 would be added to Earth's Energy Budget, since Clouds reflect more ISR than they trap OLR. If it is indeed completely related to a feedback and not also a primary such as the increase in solar output, which could produce both aspects. This is not to say that clouds do not have an impact, but just that clouds are not the sole source. That would be a bit of an over-generalization. The height and type of cloud is important as is the time of day. A cloudy night has the opposite effect of a cloudy day where low clouds are concerned, for example. If there were such a clear understanding of the impact of clouds in 1994, it would seem the uncertainity of the cloud impacts would not exist. Since the uncertainty does still exist, it would seem this calculation does not give a good representation of the overall impact, which will vary in relation to the type and height of the clouds. The feedback I am refering to comes from the Sun impacting the GCR count which produces a Cloud Feedback. I also agree that Clouds are not solely the cause of the warming. I believe that they have caused most of the warming. High Clouds have a general warming effect, and low clouds have a general cooling effect. We can see that Clouds overall, have a cooling impact. We can this in the ERBE data. That's fine if you are skeptical of these numbers. However, it does seem that this paper's estimate of 17 w/m^2 matches perfectly with the ERBE data. The feedback I am refering to comes from the Sun impacting the GCR count which produces a Cloud Feedback. A probably insignificant feedback at best. I also agree that Clouds are not solely the cause of the warming. I believe that they have caused most of the warming. You may believe anything, but the problem is being able to provide proof to support the belief. I do not see the information in the link. Could you point it out to us? Not really, you can get the averaged increase plotted for that period, but not the effect CO2 had over that period. Only if you assume the warming was 7 w/min^2 over that period. Only if you accept the average was linear and the clouds must provide the remaining amount. If you make sufficient assumptions, but the assumptions are far from proof. Or not. The assumptions upon which this was based are critical for the conclusion and if they are flawed the conclusion is as well. Only if there are generally more low clouds generally causing more cooling than high clouds generally causing warming. Think there are enough generals to prove the over-generalization yet? So one year there was cooling in the range of 13 - 21 w/m^2 as opposed to the previously claimed general warming of 7 w/m^2 over two decades? What would the general trend be in this and why? Wayne, what is the point of arguing with an unwanted garbage spewer?? You are not going to change his hired mindset, and all he is is pollution that should be banned from any environment website. It is a long known fact of human caused climate change for the worst. There is no argument. If anything, just report how bad it is getting and the necessary changes like elimination of coal and other fossil fuel use. Arguing a known phenomena only wastes bandwidth. Now I have to bump all the real science above this pointlessness. Snowy is still young and there is hope for him to learn and as such there is no waste of anything in the attempt to educate him to think more logically and to find the better data. Snowy, I do not see anything from you in the second post above, did you mean to reply? You are mistaken. The Sun-GCR count-Cloud Feedback is a very powerful feedback, and we can see this by looking at past data. Solar Activity inverted over GCRs and the Cloud Cover anomaly. Cosmic Rays and Temperature over 500 million years. Higher Solar Activity causes a stronger solar wind, and a more powerful magnetic field, which diverts Cosmic Rays away from Earth, less clouds are produced, and the Earth's temperature goes up. Excellent point! This is something that the GHE skeptics are currently lacking. Here, the two scientists are figuring out how much additional energy has gone into Earth's Energy Budget through cloud albedo changes. They determine this through a method known as the earthshine method. Couldn't you get the average forcing CO2 has had over that period through this proportion? The observed cloud albedo changes through the earthshine method do show, that Clouds have added 7 w/m^2 to Earth's energy budget over a 21 year timeframe. We know that there are other forcings and feedbacks that impact Earth's climate besides these two. So we therefore then know, that the percentage (4%) that CO2 has contributed to the late-20th Century Global Warming is likely even smaller. I don't believe that this was for a year at all. These images don't really have anything to do with a timeframe actually. These images were collected from the Earth Radiation Budget Experiment, and depict what energy changes would occur if Cloud Cover covered 100% of the Earth. If all clouds covered the Earth, the Earth would see 13-21 w/m^2 less energy reaching the Earth's surface. Vice Versa, if all Cloud Cover was removed from Earth's surface, an extra 13-21 w/m^2 of energy would be added to Earth's Energy Budget. More information on the ERBE data can be found here. The paper that the climate4you.com paragraph mentioned was the Hartmann 1994 paper. Hartmann, D.L., 1994. Global Physical Climatology. Academic Press. 357 pp. If you search or move to a new screen and return to a reply that reply is automatically set to the initial quote and any replies are lost. That may have been what happened to you. I save the post outside of the forum if I have to search for links, etc. The data would be more supportive if the GCR were proven to be the primary cause of cloud formation, which has not been proven and we know there are many other causes of cloud formation. A link to the original paper's graphic would be better in this case. It would also give the mechanism by which the could height and denisty were determined for this graph. Again the original data link would be useful since this is low cloud only and from the information there is quite a bit more variation in the cloud cover than is indicated in the CGR. Temperture would be tied to increased/decreased solar activity as it would increase/decrease energy input to the system. The original data might give a some insight as to why this would be tied to GCR. Again the original paper would be best, but there is an indication of the "fit" which gives a clue to the source. If I am correct in the original source the reconstructed GCR graph was "adjusted" to fit the temperature track. That adjustment involved movement by several MILLION years to get the "fit". Not a very good proof in that case. That is the hypothesis, but I believe there is still more uncertainty as to the level of impact than you present. I think there is little proof on either side of the GCR/cloud impact discussion at this point. It is the proof of a positive connection that is required as the negative cannot be proven, just implied by lack of proof. And the data on the earthshine method is supported where? The very crude approximation is correct and far from a proof. And the earthshine method is generally accepted by whom? The reference in this assumes the very crude approximation agrees with it, but there is no reference to how the dtermination was made nor over what period of time. You are using a average over time, which is different from the actual increase over time and thus the actual impact over time and comparing it to a different set of data over a different period of time. You could get the average forcing over that period of time, but that does not mean the average forcing over each section of the period would be the same unless the impact was constant and linear. Average the numbers 4, 2, 4, 2, 3, 5, 5, 4, 6, 7 and you get 42/10 or 4.2. The average for the last half is 27/5 or 5.4 and the average for the first half is 15/5 or 3. The average of the two averages is still 8.4/2 or 4.2, but the actual period averages are significantly different. Yes, and the warming associated with the increase in energy is what exactly? If the change of 7 w/m^2 were accurate, whcih is still under discussion, you claimed the warming was that amount, which was not connected to an actual temperature. No, you may suspect or even hope that is the case, but it is not known. I don't believe that this was for a year at all. These images don't really have anything to do with a timeframe actually. So the reference to a year's worth of data was not connected to the stated range? Since you seem to believe the blog is proof, can you give us what period that cooling was supposed to cover? These images were collected from the Earth Radiation Budget Experiment, and depict what energy changes would occur if Cloud Cover covered 100% of the Earth. If all clouds covered the Earth, the Earth would see 13-21 w/m^2 less energy reaching the Earth's surface. Vice Versa, if all Cloud Cover was removed from Earth's surface, an extra 13-21 w/m^2 of energy would be added to Earth's Energy Budget. Not according to your link. 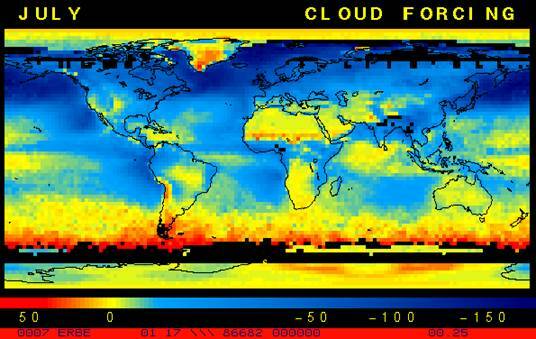 A major research problem addressed with the ERBE program was how clouds affect the radiative energy balance of the planet, and thereby climate change. The cloud-radiative forcing is simply the difference between the clear-sky and cloudy-sky radiative energy gains. To make this determination, ERBE had to separate clear-sky scenes from all others. The solar and terrestrial properties of clouds have offsetting effects in terms of the energy balance of the planet. In the longwave, clouds generally reduce the radiation emission to space and thus result in a heating of the planet. While in the solar (or shortwave), clouds reduce the absorbed solar radiation, due to a generally higher albedo than the underlying surface, and thus result in a cooling of the planet. View the maps of cloud forcing given above. 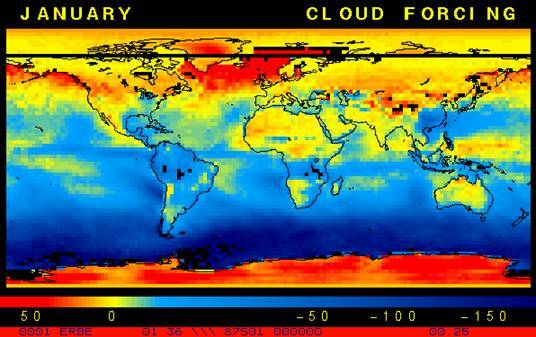 Does the presence of low level clouds over oceans heat or cool the planet? What about the convective clouds over the oceans? In terms of hemispheric averages, the longwave and shortwave cloud forcing tend to balance each other in the winter hemisphere. In the summer hemisphere, the negative shortwave cloud forcing dominates the positive longwave cloud forcing, and the clouds result in a cooling. For deep convection the solar and longwave effects also cancel. It seems to indicate the monthy cloudless data was separated from the monthy cloudy data and the mean average of the two were compared. Ahhh the secondary reference which was not presented.